During my last pregnancy I avoided wearing any nail polish at all, (and thus also using polish remover), to avoid any risks to my unborn baby. I am now pregnant again and still breastfeeding, but feeling very unglam, so wanted to look into alternatives to traditional nail polishes that are safe for mums-to-be and nursing mothers. In 2006, some companies removed the top 3 nasties from their polish when lobbied by some consumer groups. However, these have still been found to be present in many nail varnishes. These 3 are dibutyl phthalate (DBP), toluene and formaldehyde. Phthalates like DBP have been associated with developmental and reproductive effects, and cancer in lab animal testing. Toluene, a solvent, is apparently a neurotoxin (risky for unborn child) and respiratory irritant. It can be inhaled and absorbed through the skin and nails. It could also be listed on the label as “toluol” or “phenylmethane.” Formaldehyde (used mostly as a hardener) has been named as a carcinogen. According to some sources, solvents such as butyl acetate or ethyl acetate which are still widely used, are also nasties (they are flammable liquids! ), although I understand butyl acetate is derived from fruit. Mavala's Mava-lous nail polishes are free from Toluene, Formaldehyde, Phthalates (DBP), Collophane, Paraben, Camphor, Animal Ingredients and Heavy Metals. They have also recently been awarded the Best Nail Polish in theNatural Health Awards 2013. This was my favourite to use- a 'grown up' range, with small portable bottles and good colours. However, it does contain butyl acetate and ethyl acetate. Colour options- I tried the lovely red from their new bright and summery Chilli and Spice collection but they come in 220 shades, so plenty to choose from. 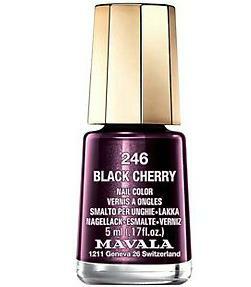 I like the look of Black Cherry shade 246, see pic below! Lasting power- Day 1 no chips, Day 2 starting to chip slightly on some ends, Day 3, really chipped! 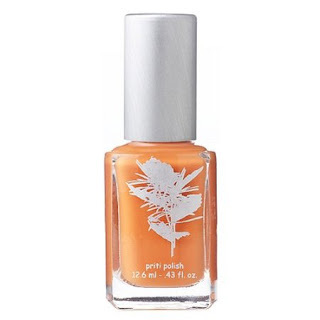 PRITI NYC polishes are Animal Cruelty Free and vegan, non-toxic, and are free of toluene, dibutyl phthalate, formaldehyde, formaldehyde resin, and camphor. They claim to be fast drying and chip resistant, and contain a UV inhibitor. They are also safe for use on children and designed to be safe for mums-to-be. This polish remover is fully biodegradable, non-toxic, and non-carcinogenic, and the bottle is completely recyclable. The remover has been infused with soybean esters, is naturally derived, and contains lemongrass essential oils. No acetone, which has been linked to birth defects. This remover worked as well as a normal polish remover but make sure you do it over a sink or similar as it makes the polish colour drip off onto the surface below which could stain it. In the sink it just washes down if you give it a scrub.